A major renovation infuses touches of softness and, yes, a special space for glass art. THE THREE MATURE Mount Fuji cherry trees along the front rockery were a motivating factor when Dale and Leslie Chihuly bought their home in the Denny-Blaine neighborhood a few years ago. But not much else about the garden was worth preserving. “There was no usable outdoor space, and no privacy,” says landscape architect David Pfeiffer, who collaborated with Norman and Elisabeth Sandler, architect and interior designer, on a major renovation of the Chihuly house and garden. Leslie is clear about what the family hoped for in their new garden. “We wanted intimate entertaining areas for friends and family, and a swimming pool and lawn area for our son and his friends,” she remembers. 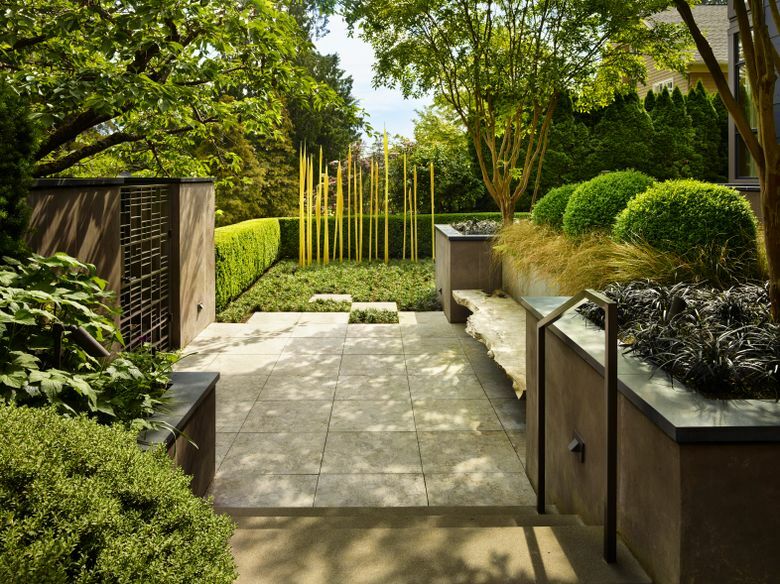 They wanted the style of the garden to complement the interior of the house. Because the partially constructed house sat awkwardly high on the site, one goal was to integrate it into the garden. The home is tall, contemporary in style, and a flight of stairs up from the street on an exposed corner lot. 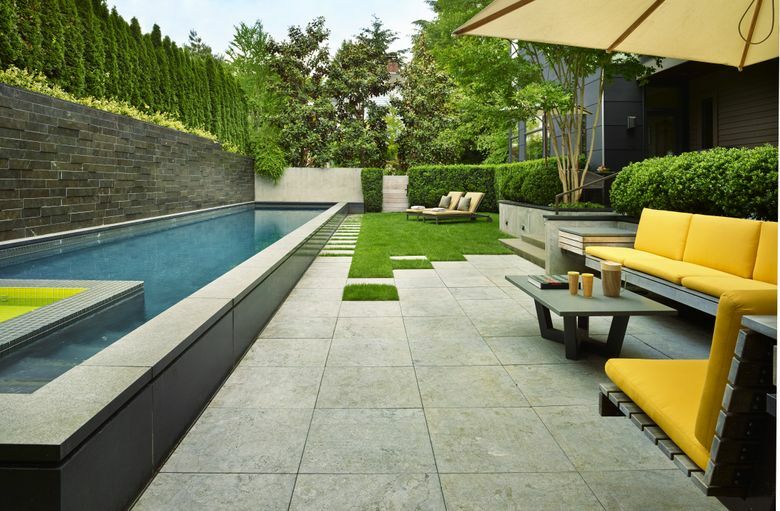 Pfeiffer’s challenge was to create a garden that settled the house comfortably into the neighborhood of mostly older homes, while creating privacy for the family. The first step was to bring in boulders to turn the meandering front slope into a stable rockery in scale with the house. The size and cragginess of the stone, now softened by moss, create a dynamic interplay with the sleek concrete retaining walls. Pfeiffer continued this tension between the organic and the architectural by choosing structural plantings like multi-trunked crepe myrtles (Lagerstroemia ‘Natchez’) and clipped hedging to contrast with a palette of native plants that change through the seasons. Now wide, inviting stairs lead up through the rockery. Virginia creeper clads the concrete walls, turning them vivid red in autumn. Willowy ornamental onions (Allium ‘Globemaster’) flower purple in May and June; epimedium and saxifrage provide year-round foliage. Native plants, from snowberry to sword fern, nurture insects, birds and urban wildlife. Pfeiffer created a compatible interplay of ornamentals and native plants throughout the property. 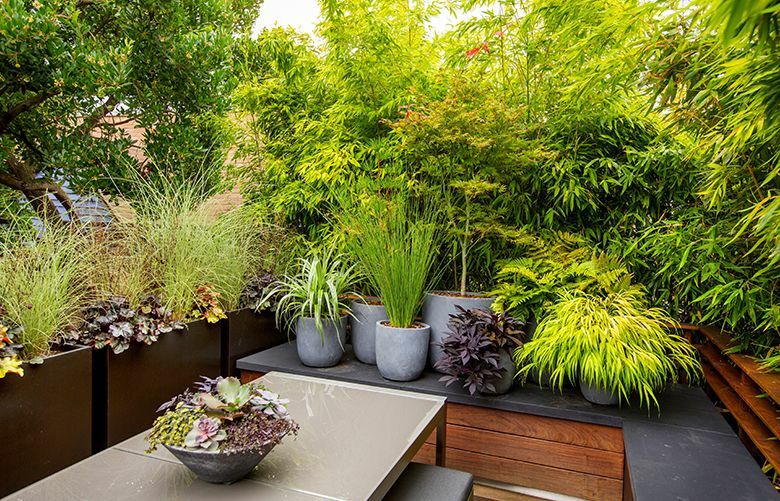 The result is a garden that is mostly green-layered-on-green, with euphorbia, Japanese anemone, daphne and bugbane (Actaea racemosa) adding dashes of color through the year. 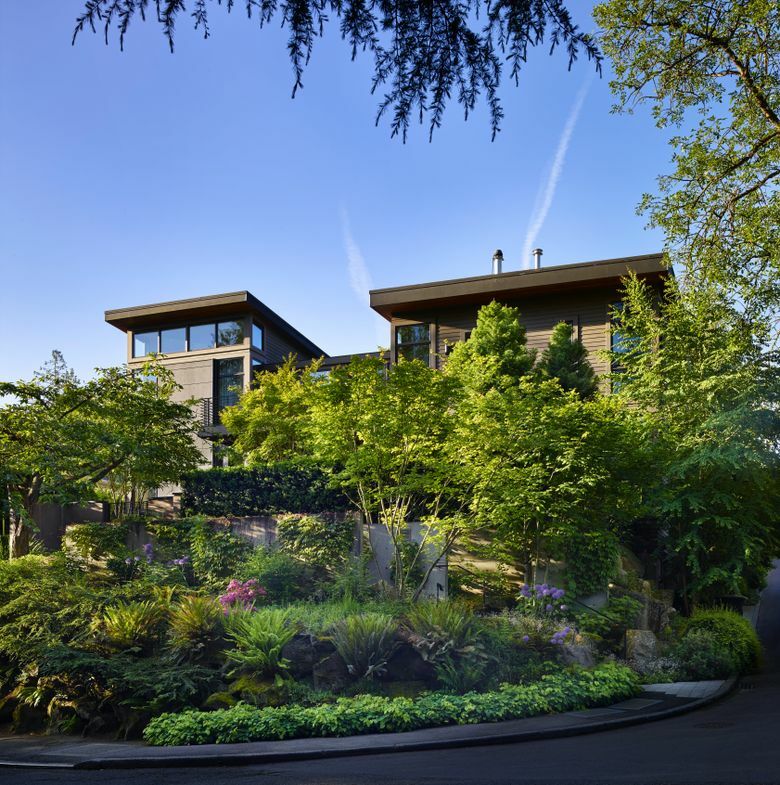 As you navigate your way up to the garden, you get a hit of nature in the city, from the vine maples overhead to the sound of water flowing down the not-yet-revealed water wall. Pfeiffer took on the challenge of extending the clean lines of the house out into the garden without losing the sensuality of the plants. Along the front of the house, two rectangular ponds, lined in smooth, oval stones, run right up to meet the windows. 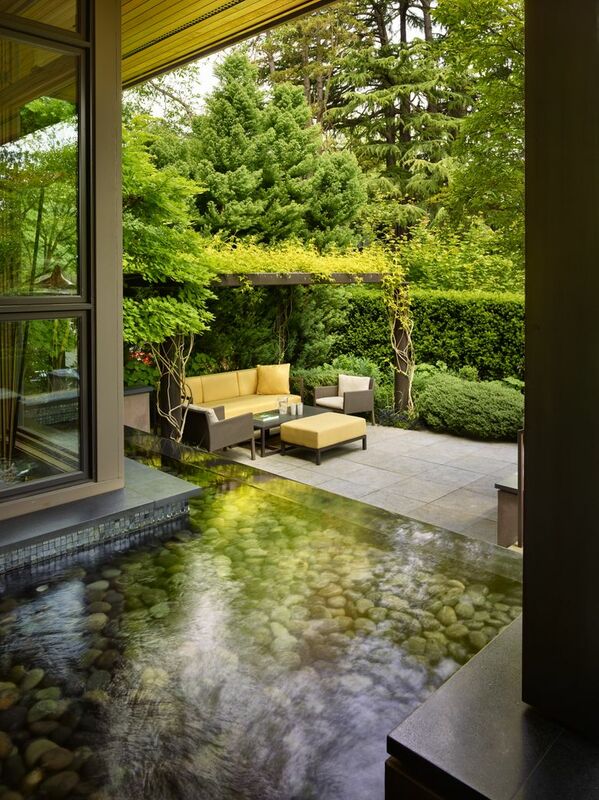 The result is a visceral harmony between indoors and out, with the garden reflected in the windows, and the sky and clouds reflected in the water. 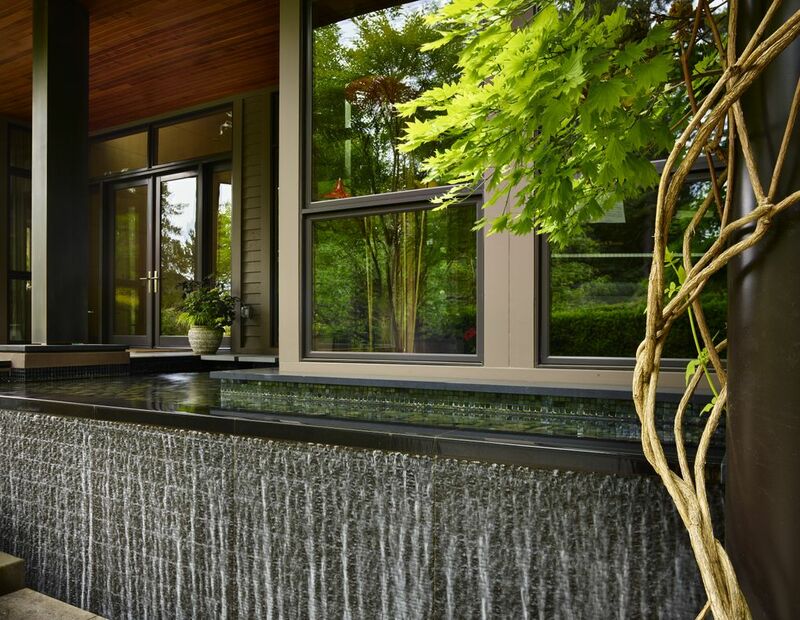 At the edge of one of the pools, the water plunges down a wall of roughly textured black granite, creating water music. Directly adjacent is an outdoor room with comfy furniture, sheltered by a metal pergola threaded with fragrant, golden-leafed jasmine, overhung with the golden leaves of the exquisite full moon maple (Acer shirasawanum ‘Aureum’). 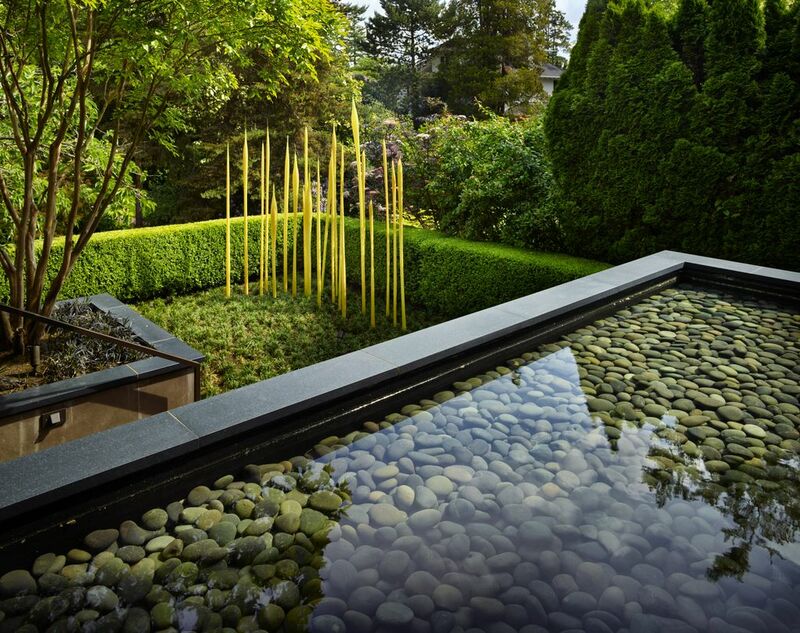 Dale Chihuly’s multipiece “Citron Reeds” is showcased in a Zen-like corner of the front garden. 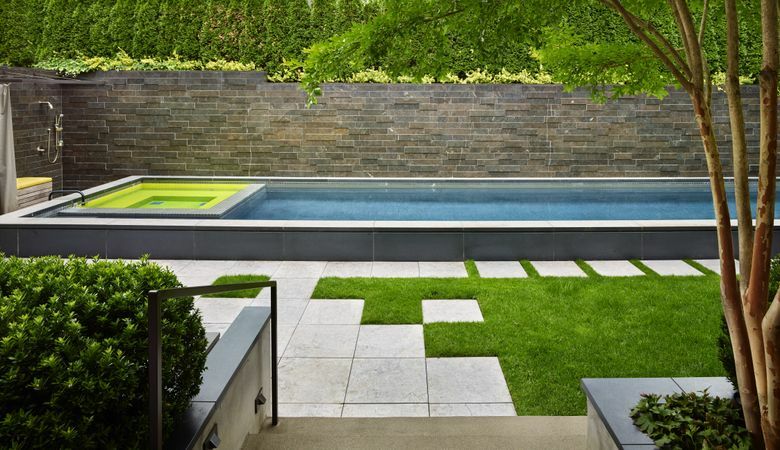 Pfeiffer designed a quiet space carpeted in tufts of low-growing, green mondo grass and hedged in boxwood as backdrop to the forest of slim glass reeds. In his home garden, Chihuly is a minimalist. The back garden is all about swimming, visiting and relaxing. A shady path lined with Japanese forest grass, sarcococca and ligularia leads around the house to what used to be a steep, unusable slope. “It was an engineering feat to capture this space,” says Pfeiffer, of the area floored in grass and pavers. 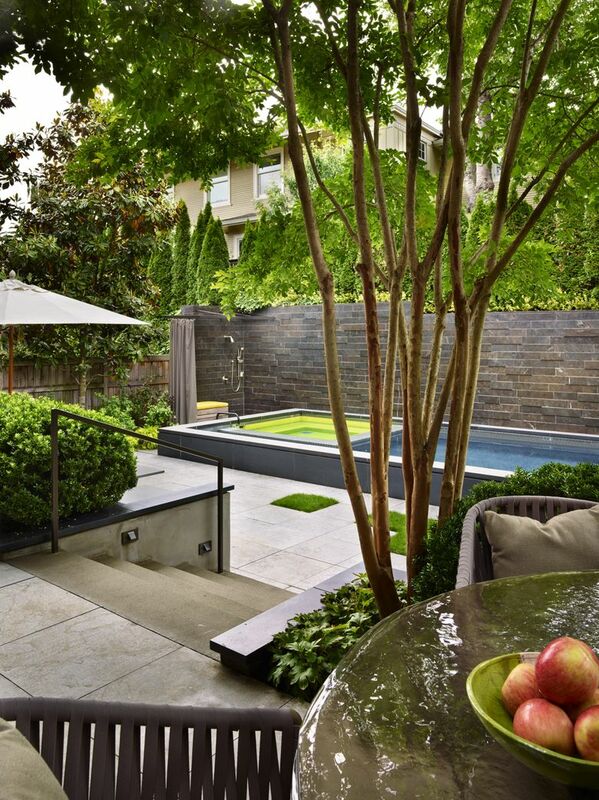 A raised lap pool stretches nearly the width of the property, with a chartreuse-tiled hot tub as focal point. Clipped hedges atop a long wall, with screens of Magnolia grandiflora ‘Little Gem’ at each end of the space, provide privacy from the neighboring houses; yellow-cushioned chaises and benches invite lounging. And what about the fate of the cherry trees that kicked off the project in the first place? “It was a difficult decision to be able to save only one of the trees, so we worked to make the remaining tree feel special at the interior gated entrance to the garden,” says Leslie. The white-blooming cherry’s height and breadth, easily visible from the home’s living room, help tie the new landscape to the venerable trees and gardens of the old Seattle neighborhood that surrounds it. 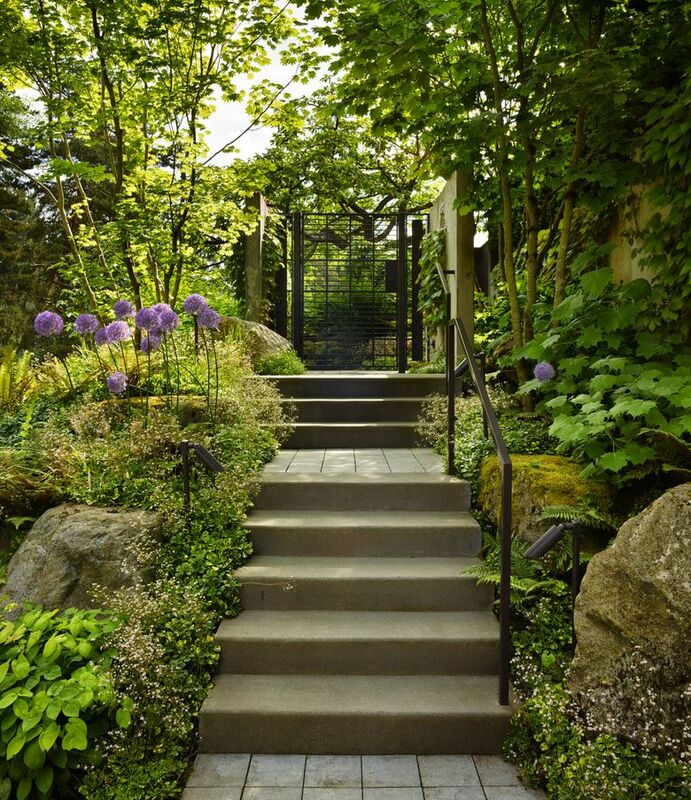 Valerie Easton is a Seattle garden expert and freelance writer. Reach her at valeaston@comcast.net. Benjamin Benschneider is a Pacific NW magazine photographer.